Why Nactus is the answer to modern learning and teaching! Indeed, knowledge is an integral part of our lives as it boosts our creativity and imagination. With the progressing world, the modes of teaching has advanced and learners are now approaching world-wide-web to quench their thirst of education. But, is there really a concrete medium where tutors and learners can meet, to share their expertise and gain knowledge? What about online security and proper management? Are they ensured online? Well, yes! 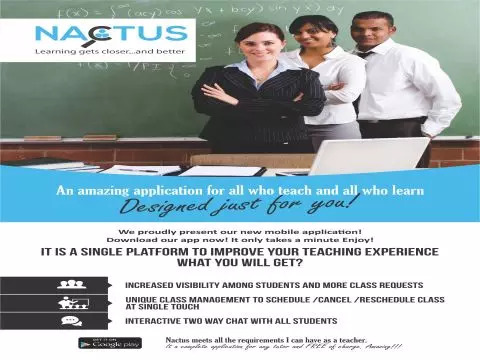 Nactus– an online education-system does ensure that! It’s a platform which aims at improving the overall learning experience by facilitating not only the discovery of tutors/trainers around, but also providing us with other technological tools to make our learning more organised and efficient. It facilitates a common platform where students and qualified tutors can meet and have access to the right tools to make learning effective and convenient. How is it feasible for tutors? How is it beneficial for students? Why Nactus is better than other social platforms for communication with students? Only a teacher can see the contact details of their students. Therefore, the student’s information is protected from undesirable access. Convinced? Why not try it? Nice post! Haven’t seen you around my blog in awhile, what’s up? Come and visit me when you get a chance! Previous Previous post: Helios Shoe Care Product Review! Next Next post: Kitchen Style Board in association with Big Chill: 2016 Pantone Color of the Year!